The attached photograph was kindly provided by Matt Howard whose grandfather was a policeman at Taree in the early 1900s. 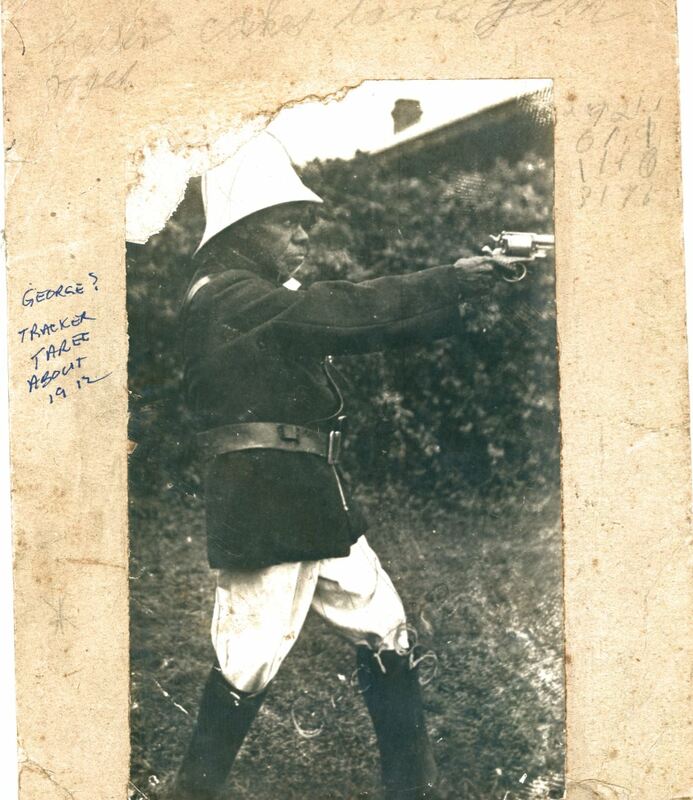 The inscription tentatively identifies the subject as George and dates the photograph to approximately 1912. According to official records, trackers were not employed at Taree in 1912 or at any time in the 20th century. Pathfinders invites members of the public to contribute information that may assist in identifying the tracker in the photograph. One possibility is that the subject may be George Thorpe who was born at Surveyors Creek near Walcha in 1879 and was part of the team who pursued Jimmy and Joe Governor in 1900. The following year George Thorpe was the tracker at Blackville on the Liverpool Plains. He later moved to Purfleet Aboriginal Station near Taree where he passed away in 1950.Papers re Jimmy and Joe Governor SARANSW 4/8582; Police Salary Register 1901 – Trackers SARANSW 3/2993 Reel 1973; Death Certificate of George William Thorpe 1950/006628. 1. ↑ Papers re Jimmy and Joe Governor SARANSW 4/8582; Police Salary Register 1901 – Trackers SARANSW 3/2993 Reel 1973; Death Certificate of George William Thorpe 1950/006628.